Elegant and stylish this dress can fit into any bridal party. 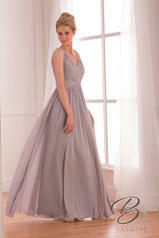 This poly chiffon bridesmaid gown features a portrait neckline and an A-line skirt. Tasteful ruching along the bodice gives the classic silhouette a modern twist. Other skirt lengths are available in this style.